Photographs created by New York artist Xiomáro (pronounced SEE-oh-MAH-ro) will be included in the LeRoy Neiman Art Center’s exhibit Courage and Creativity from June 2 to July 12, 2014 in Harlem, New York City. The exhibit showcases works inspired by an observation attributed to the renowned artist, Henri Matisse: “creativity takes courage.” In keeping with this theme, the Art Center invited a number of contemporary artists that are unafraid to express emotions and ideas for public consideration and critique. The Art Center selected three large black-and-white photographs from Xiomáro. 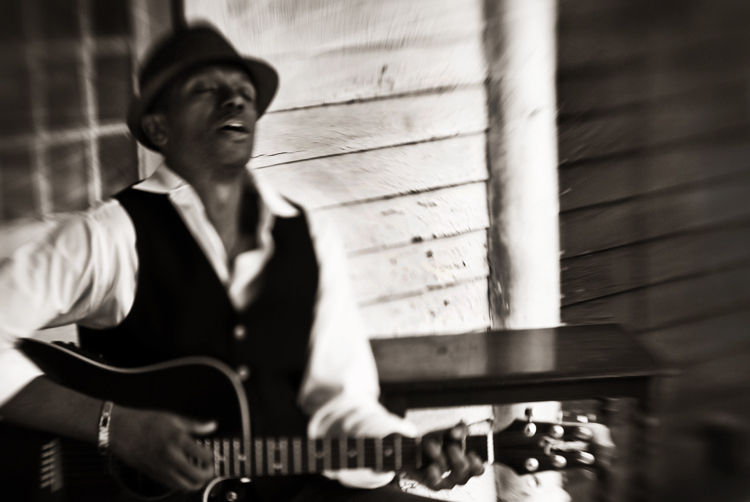 The Courage to Free Your Soul is a candid portrait of Saint, an indie musician captured in a rapturous moment of playing his guitar at Weir Farm National Historic Site in Connecticut. The Courage to Reveal the Truth presents a poignant view of white crosses at what is believed to be a slave burial ground at the estate of William Floyd (a Founding Father who signed of the Declaration of Independence), which is a National Park Service site on Long Island. For The Courage to Break the Rules, Xiomáro disconnected the lens from his camera to create an other-worldly image of the lighthouse at Cape May Point, New Jersey. Xio is a nationally recognized artist whose work has been exhibited during Black History Month at African Burial Ground National Monument in New York City and is currently on display at Harvard University for a year-long exhibition. The artist has been covered by The New York Times, The Huffington Post, Fine Art Connoisseur and many other national media outlets. He began as an Artist-in-Residence at Weir Farm National Historic Site in Connecticut where he continues as a Visiting Artist and is frequently commissioned by the National Park Service to create photographic collections that breathe life into iconic historical leaders. A free e-book containing some of Xiomáro’s work is available at www.xiomaro.com. Twelve other artists are part of the exhibit including Ellsworth Ausby, Nancy Elsamanoudi and Hubert Williams. Forty percent of the proceeds of all sales from the Courage & Creativity exhibit will benefit the Arts Center as well as Arts Horizons, a non-profit arts-in-education organization tasked with strengthening the Harlem community and beyond by providing quality arts experiences for children and families. In addition, Art Splash 2014 is a fundraising companion event taking place on June 5, 2014, from 6:00 pm to 9:00 pm, to recognize several individuals whose professional achievements represent the courage and creativity promoted by the exhibit. Sarah Dash from the famed pop group LaBelle is one of the honorees. The LeRoy Neiman Art Center was launched six years ago through a generous gift from the renowned American painter LeRoy Neiman (1921-2012) who is known for his expressive and boldly colored images of sporting events and leisure activities. The Art Center is located at 2785 Frederick Douglass Boulevard near 148th Street in Harlem, New York City.